Once you’ve found the perfect swimsuit, you may find you still need to tidy up your bikini line before heading out to the beach. There are many shavers explicitly made to trim the hair that peaks out from under your swimsuit bottom. So you don’t need to suffer cuts and nicks from using a bulky shaver meant for your legs. Today’s bikini bottoms don’t have much material to them so that any stray hairs will be evident in the bright sun (and even slightly cloudy days, too) on the beach. You’ll need a smooth bikini lingile shave to get ready for the summer (or a winter vacation in a warmer climate). We’ve selected only the best bikini trimmers for the beach or any occasion. You’ll recognize most of the brand names, as the top manufacturers of men’s and women’s electric shavers also produce some of the best bikini trimmers. These small, easy to handle razors come in a three pack, and are specially made to trim the bikini line. Every razor has one sharp blade to provide a clean shave without irritation. The compact head, combined with the double plastic guard, makes this razor ideal for the bikini line. The extra cushioning from the double guard minimizes chances of scratches or cuts. The small size makes it easy to maneuver in the bikini area. 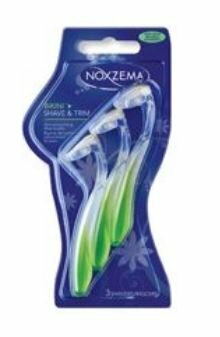 These Noxema shavers can fit into areas that are problematic for larger razors, such as the fold where your leg meets your groin. It may be one of the best bikini trimmer deals available for manual razors for this reason. It is difficult to cut yourself with these, even if you are somewhat clumsy. These tiny shavers will fit perfect in your beach bag alongside your tanning oil, and you can easily use them on the go in a hotel room. All you need is a small bottle of shaving cream or moisturizer, and you’re ready for a nice tan on the beach in an instant. This white and purple shaver resembles a wand and can be used to trim the bikini area and all body hair. It has attachments for nose and ear hair as well. This shaver is a bit bigger than comparable electric trimmers, but it gets rid of hair with a minimum of effort. The motor’s pretty quiet too, so you can use it without alerting others. You can cut or shape hard to reach areas with the wide blade, and the shaver will leave skin smooth while preventing unsightly razor bumps. 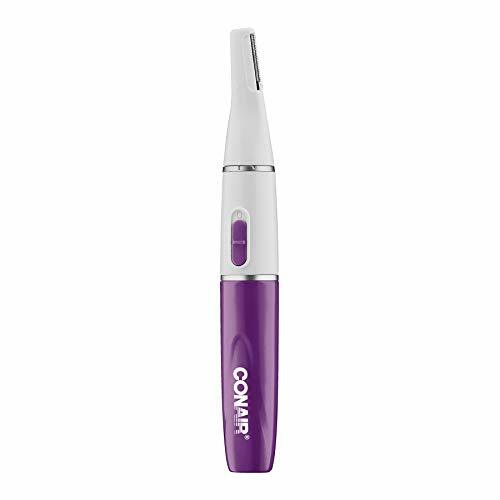 The Conair Satiny Smooth Trimmer includes two eyebrow combs and an AAA Lithium battery. This shaver is an excellent choice if you only groom your bikini line occasionally, but still, need a shaver to groom facial or underarm hair. It’s not a heavy-duty bikini trimmer but will do the job if you need to tidy up for the beach a few times in the summer. It’s easy to use and won’t leave razor bumps. Tip- Use a magnifying mirror when you shave stragglers. Use a small brush (an old toothbrush will do) to clean the trimmer head after each use. AAA Lithium battery offers a longer life than alkaline batteries. When you first see the Trimstyle Razor and Bikini Trimmer, it looks like a slightly bigger disposable shaver, but it is a mini-version of the popular and portable, battery-operated trimmers. This all-in-one ladies trimmer and bikini shaver contains four ultra-thin blades. It has a pivoting, vibrating head to follow the curves of your bikini area and legs. The Trimstyle has an ergonomic rubber handle for a steady shave anywhere on your body. Made to fit the contours of the female body, the Schick Quattro has no on-off switch. Use this trimmer like a standard razor. Flip the shaver open to reveal a vibrating hair trimmer that you can adjust to three different lengths. The comb acts as a guard to protect your skin. Remove the comb if you want a close shave. The refills included with the Trimstyle razor have Jojoba and Acai Berry conditioning strips. These hypoallergenic, all-natural ingredients moisturize and calm skin as you shave. You should still moisturize skin before shaving, but the conditioning strips give you extra protection. The Schick Quattro Trimstyle package contains one Trimstyle razor, one bikini trimmer, and one AAA battery. Twist the razor to open and insert one AAA battery into the compartment. Twist the compartment closed, and you’re ready to shave. Rinse with lukewarm water after every use. Dry the razor before putting it back in the shower – it will get rusty if you forget to do this. No More Redness and Irritation - Instantly Erased your facial hair or "peach fuzz" like magic and pain free. No stubble and felt as smooth as a fresh wax without the redness, irritation and break outs!! This whole-body epilator works for the bikini area, legs, and underarms. Unlike the other items on our list, it also eliminates peach fuzz on the face and arms. This waterproof epilator has floating heads to follow the contours of your body. The design makes shaving painless and cuts close to the hair root, and shields skin from cuts and bumps. 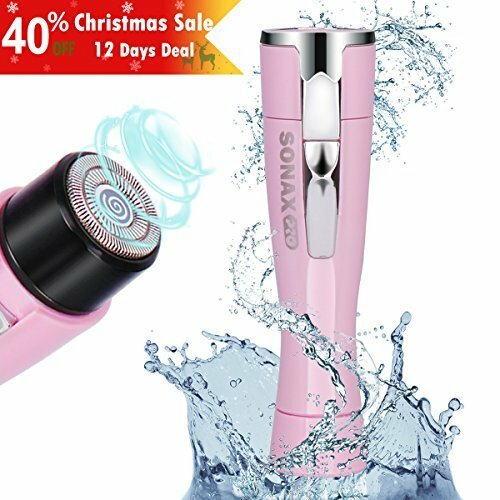 The design and execution of this epilator are such that it helps prevent ingrown hairs, which can be a problem if you regularly trim your bikini area. The manufacturer claims that this cordless, rechargeable epilator/razor will keep your bikini area smooth for up to six weeks. While your experience may be slightly different, we can vouch for the accuracy of this claim – the epilator will leave your skin smoother than a traditional shaver. You can also use this epilator with one AA battery. The epilator can be used wet or dry and with or without shaving gel. It is geared to removing hair from sensitive areas like the groin, face, and underarms. You can wash the hypoallergenic epilator casing as well. Flexiball design technology combines thin, sharp blades, a moisturizing ribbon, and an ergonomic handle that’s easy to grip when shaving your private parts. The Flexiball shape makes it easier to get a smooth shave in the contoured bikini area, but it also works well on ankles and knees. The ribbon of moisture surrounding the blades gives you a smoother shower shave. It activates when wet to keep skin moisturized when you shave in the bath or shower. The Lubrastrip adds even more moisture to prevent nicks, cuts and excessive dryness. The Flexiball also has a water-activated serum called MoistureGlide. Once you run water over the shaver head, this serum starts to work and ensure the blade slides effortlessly across your skin. You can use any Venus blade when it’s time to refill the cartridge except Venus Simply 3 blades. Replace blades by pressing the spongy button on the top of the razor. Use each blade till its dull. May users can get at least 20 shaves out of one blade. Keep blades dry between uses. When shaving underarms, you should shave up, down and sideways. Shave legs by starting at the ankle and work your way upwards. For a bikini trim shave in the direction of growth. And then shave against the hair growth if you want a closer shave. Even though this shaver has built-in moisturizing strips, you should still shower and use lather before shaving for the smoothest results. The Panasonic Bikini Trimmer helps you avoid skin bumps and irritation with its five-position shaver head. Lightweight and portable, it includes a cleaning brush to keep heads clean. This electric bikini trimmer weighs only four ounces and measures less than one and a half inches wide, so you can slip it into a handbag or tote bag and take it anywhere. The small round hair trimmer heads shave close to the skin for a cleaner bikini line. The stainless steel trimmer blade cuts fine to coarse hair and eliminates stray hairs. This hypoallergenic razor is safe for fair / sensitive skin that may be more susceptible to irritation. Two charged batteries provide 45 minutes of shaving convenience. This lightweight Panasonic bikini trimmer and shaper has a five-position selector to shield skin from its sharp blades. The guides let you choose the exact hair length and make it easier to shape hairs. Tip: For better results (and less cleaning time), only use this shaver on dry hair. The trimmer will get clogged if you use it on wet hair. Wash the shaver guard, brush the head and then rub it with rubbing alcohol after each use. This waterproof Remington shaver lets your trim your bikini line and legs in or out of the shower. The Remington Smooth and Silky is one of the few bikini trimmers with an exfoliator attachment. The rotating exfoliator head prevents irritation and razor burn and revitalizes skin. The adjustable guide lets you choose the length you want for touch ups or bikini line shaping. You clip the guide on the shaver head when to trim hair to medium, short or barely- there length. This groomer kit is easy to carry in a purse or gym bag so you can take it with you on day trips or vacation without taking up too much space. 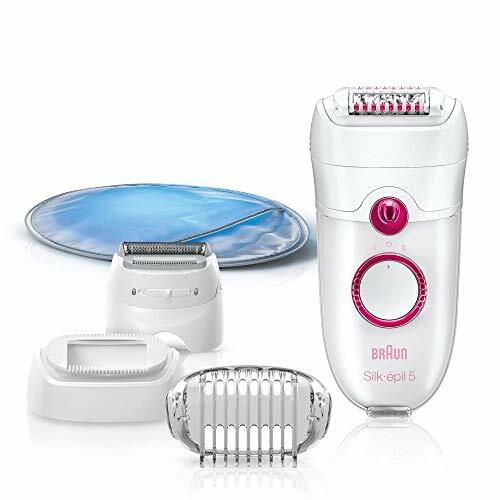 Braun Silk’s epil 5 Women’s Epilator removes hair from your bikini area, legs, and underarms, even your face without cuts or nicks. This epilator has 40 tweezers to clip even the shortest hairs on your bikini line and keep them from coming back for up to a month. The pivoting head helps you fit the epilator into contoured and tight spaces. This epilator will keep your skin smooth and stubble-free if you like to wear string bikinis or thongs. The epilator has a shaver head and trimmer cap you can use to turn the epilator into a shaver if you’re not sure about using the built-in tweezers on a particular area. We like this epilator because it offers lots of extras to help you trim bikini line more thoroughly. The high-frequency massage system provides a safe, pain-free epilation, and the SmartLight helps you see fine hairs you would miss otherwise. Using an epilator is no different than using a bikini trimmer. Hold the device naturally and don’t press it on the skin. The rolling massagers on the device also contribute to easy hair removal. Clean and exfoliate before using your epilator. Prepare your skin the same way you would if you were using a bikini shaver. The Power 5280 Kit contains one epilator, three caps, a cooling glove, cleaning brush and a pouch. Choose another product, preferably an electric shaver, if you have sensitive skin. This epilator takes some time to get used to, and you will feel pain and get some redness the first few times you use it. You may need to take some ibuprofen (as you would before a bikini wax) when you use the Braun Silk epil-5 for the first time. 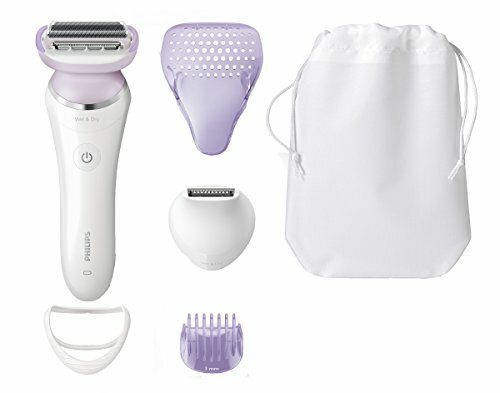 You can also use the shaver head instead of the epilator if you’re sensitive, but it won’t leave your skin as smooth. This model should only be used dry. There are wet/dry models available. There will be some pain the first few times you use this epilator. Portable and easy to use, you can recharge the lithium-ion battery for one hour of continuous use. 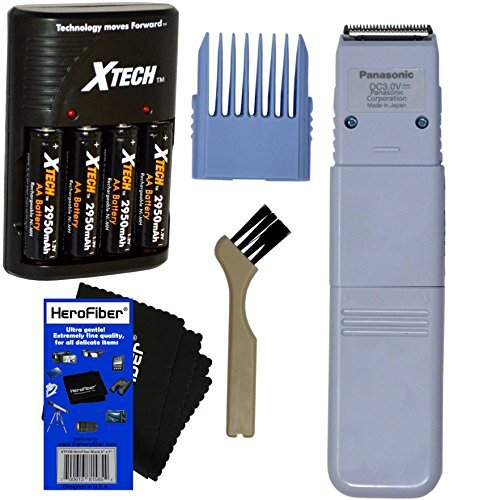 This Prestige kit includes bikini trimmer head and comb, travel pouch and efficiency cap. The multi-flex head has dual floating foils for smoother, closer shaves w and the flexing neck ensures that you miss fewer hairs. An S-shaped ergonomic design gives you a better reach in the bikini area and elsewhere on your body. Hypoallergenic dual foils protect skin from even the closest shaves. The Philips HP3606 has plenty of features to make your bikini line hair disappear and safeguard your skin. The pearl tip trimmers are rounded with safety bars underneath to reduce redness and irritation. Soft touch cushions on either side of the shaving head help you guide the shaver in curvy, sensitive areas. Use in the bath or shower for more comfort. You can rinse the shaver head underneath the faucet to clean it. A University of Texas study showed 77% of women who removed bikini line hair favored shaving over creams or trimming with scissors. Most women groomed pubic hair for a “neater, cleaner look”, although a few hundred of the 1,677 women questioned said clothing styles demanded a trimmed bikini line. And only 5% of women went to a salon for a bikini wax. The best razor for bikini area may be an electric, manual, or a multi-purpose shaver that you can also use to trim the hair on legs, underarms and other parts of the body. Most of the razors and electric shavers on the market today are multi-use devices. You won’t need to buy separate razors for your legs, bikini, underarms or even your eyebrows, as many shavers come with detachable trimmers for each purpose. You can use an electric bikini trimmer for years, although you need to clean the shaver head, recharge it or replace batteries, and follow other maintenance procedures suggested by the manufacturer. The shave you get with an electric trimmer won’t be as close as the one you get with a manual bikini shaver. Electric trimmers are much larger than a manual razor, so unless you buy a small trimmer specifically made for the bikini area and other sensitive body parts, you may not be able to eliminate all excess hair. Use a manual bikini line trimmer if you are the patient type and you’ll probably get a closer shave than with many electric shavers. Manual shavers are also called reusable or disposable razors. Reusable razors usually contain one or more blades in a plastic casing and handle. These lightweight razors offer the easiest and closest shaves, though they can cause nicks if used without shaving cream. Choose disposable razors with a safety guard to protect your skin and more than a single blade for a closer shave. Most ladies’ bikini shavers also have a curved, easy to hold handle to better maneuver your mid-section. An electric epilator can be used in addition to or instead of a shaver. An epilator removes hairs from the root using tiny tweezers. 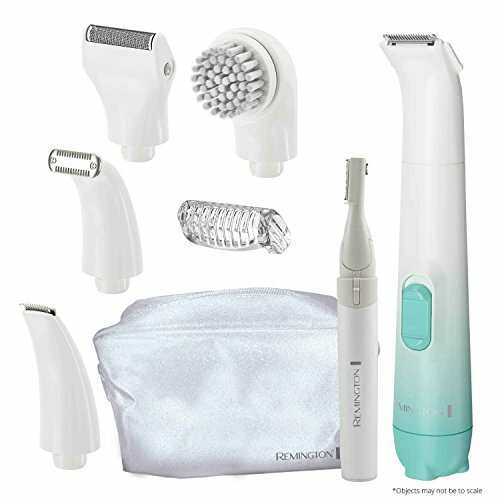 Most epilators resemble a small electric shaver and operate in the same way, so it may be hard to tell the difference until you’ve finished trimming. Epilators reduce the number of times you need to shave for a smooth bikini line. These hair removal tools work best if you go to the beach a lot or just like a cleaner look year-round. Epilators can be extremely painful on sensitive skin,f and even hardy types will wince at the first few treatments. Avoid epilators if you want a pain-free treatment from the start. Regardless of the kind of shaver you use, there are specific rules for how to shave your bikini line. Start with the best bikini razor for your body. Choose a firm manual razor with a smoothing strip, or a small, curved electric razor with attachments that protect skin from irritation. Prepare the area before shaving for a smoother shave and less irritation. Trim the hair with small scissors, so it’s a quarter of an inch long. Soak your bikini area in warm water for ten minutes to soften the hair and the top layer of your skin. You’ll be able to remove hair faster when skin is soft. Pat the area dry, then use an exfoliating scrub to get rid of ingrown hairs. Apply a quality shaving cream containing shea butter, olive oil or other moisturizing ingredients. Shaving cream provides a buffer for the razor. Shave with the hair growth, not against it. You’ll get bumps if you shave against the growth, as the razor will scratch the follicle. Focus the blade downward and don’t apply pressure. One pass should be enough to cut the hair, especially if the razor has multiple blades. Wash off the area as soon as you’re done and hold a cold compress on it for a few minutes to prevent redness and irritation. Apply tea tree oil, witch hazel or another anti-redness treatment. Topical steroids can be used if the pain is intense. Moisturize with a light cream or oil containing aloe vera, Vitamin E or jojoba oil. Clean blades after use with water and rubbing alcohol. Discard old blades after using them five to seven times, as they will be dull and ineffective. Old blades can also harbor bacteria. If you use an electric bikini trimmer, clean excess hair with the cleaning brush that came with the shaver. Follow the directions in the instruction manual for further maintenance tips. Ultimately, the type of bikini trimmer you use depends on how often you shave, how plentiful and coarse your hair is (and how quickly it grows back), how much hair you want to eliminate, and the time you’re willing to spend prepping, completing and doing aftercare when you shave. A woman who wants to trim pubic hair, so she looks better in short shorts or a regular bikini bottom will probably do well with an electric shaver, but if you wear a g-string or thong-type bottoms, you’ll need lubricated bikini razors or an epilator. Back in the mid 20th century, a bikini line trimmer implement could be referred to as a beaver shaver, but now we usually use a term like the best bikini trimmer. Check out our reviews of some of the top bikini razors and epilators. Electric shavers are portable, but it can be a hassle to recharge them or to change batteries on the way to the beach. Epilators require lots of preparation and recovery time, and can’t be used on the spur of the moment. We recommend any electric shaver with attachments for bikini line, body, face, etc., to make the charging time worth your while if you don’t want to use a disposable razor. 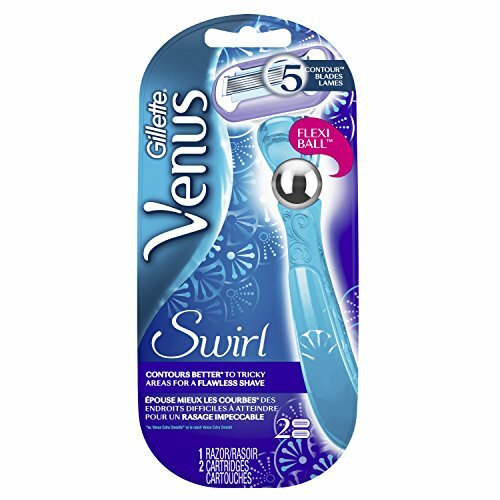 Our pick for best bikini trimmer is the Gillette Venus Swirl Flexiball Women’s Razor – 1 handle + 1 refill . Made by Gillette, a trusted name in razors, the Venus brand is considered one of the best ladies’ razors on the market for clean, safe shaving. The Venus Swirl Flexiball offers many features to make it easy to get a clean, bare look that makes you look good in the skimpiest bikini. It hits most of our required features for a top-notch razor, with a few extras thrown in for good measure. When you’re at the beach, you’re under scrutiny for your skin (even if you’re the only one doing the appraising). The Venus line of razors from Gillette are known for their safe but sharp cutting power, and all Venus razors are shaped to handle the curves of the bikini line and legs. You can buy this Gillette Venus Razor online or in a store, which gives it an advantage over the Noxzema Razors, which are normally available online only. If you’re just impatient or sensitive, the Venus Swirl Flexiball has features to take care of moisturizing, protect your skin and give you a closer shave without a lot of effort on your part. Since the Swirl is battery-operated, it gives you more power than the average manual razor, but it’s just as easy to use. There’s only one attachment (the bikini trimmer), and you’ll need to change the battery occasionally. The Swirl is a hybrid between a small electric shaver and a manual razor. We chose a manual shaver for a few reasons. You can bring or buy disposable razors anywhere and you don’t need to worry about charging the shaver or buying batteries. This fact alone would make a manual razor perfect for the beach, but disposable razors are also known for their ability to shave close and eliminate more hair from the bikini line. We hope these reviews and the accompanying information will help you select the best razor for a better beach look this summer – or a smoother bikini line year-round.